During the same era, synthetic fibers such as nylon and rayon also became impetus. With the advent of the Industrial Revolution and the French Revolution in the 19th century, several alterations were witnesses in the manufacturing processes that brought in some tremendous changes in the features of lace. With the introduction of machines for lace weaving, the cost for manufacturing became considerably less expensive than the previous days. Lace Is Quite Different from the Embroidered Fabrics:- Lace is often referred to as a form of the embroidery. But the chief distinguishing point is that embroidery work is an ornamentation form crafted on a finished fabric whereas lace is a finished fabric in itself. Although there are some lace categories like the filet and the limerick that are commonly used as an embroidery form stitched on a complete fabric. Varieties:- There are huge variations found in the collection of the most well-known Lace Wholesalers in Kolkata. Corded:- It is the superlative quality lace that is crafted by outlining the details of the cloth using a heavy and a lustrous cording. Guipure:- This is a heavier form of lace generally made using silk or linen and the heavy metal threads. Chantilly:- This form of lace is in huge demand and is made using silk. This type of lace is so much popular because of its intricate patterns. The fashion designers use it extensively in their creations. Beaded:- This is another lace variety found easily in almost all the stores of the Fabric Wholesalers in Kolkata. The fabric is embroidered with sequins and beads that help in accentuating the entire look of the fabric. Limerick:- This is also an intricately hand-stitched lace on a mesh based cloth. Filet:- This is similar to a decorative net fabric produced from the net of a fisherman. Irish Crochet:- This variety of lace has a 3D look. Diverse Uses of Lace:- Lace fabric is comprehensively used for decorative purposes as well as in the clothing industries. 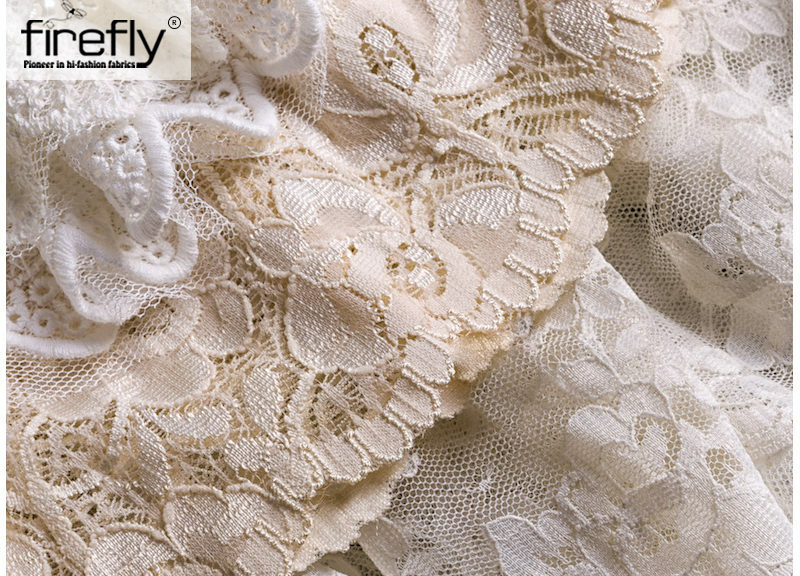 The mesh-like appearance provides a delicate and classy touch to lace fabric. The slender ones are used for trimming, whereas the bordered ones are used for prettifying the curtains, outfits, and the table cloths. How to Maintain Lace Fabric? The lacy outfits must be dry-cleaned. In order to prevent the textile from getting yellowish, it must be stored in between the layers of the tissue papers of preferably blue color.